Incomes for single mother-led households are flat or falling as other families see gains. Jennifer Phipps thinks a lot about Alice, the title character of the 1970s television show. Like Alice, Phipps has a son she’s raising on her own. The boy on TV, frozen in time, is close in age to hers. The rest of the fictional single mother’s world seems foreign to Phipps. Linda Lavin’s Alice easily affords an apartment on a waitress’s pay. Her son dips in and out of her work, untethered from grownup oversight or child care. Phipps, a research coordinator at the University of Washington, is considering moving in with other single mothers to save on rent. Leaving her boy to pinball on his own is not an option. King County’s economic boom isn’t lifting single mothers like Phipps. Of all earners, women with children and no partner continue to earn the least. And, as other family types see gains, income for single moms has flatlined since 2009. Between 2015 and 2016, single mothers’ earnings actually appear to have dipped. Census Bureau surveys show the problem is worse for King County’s Black and Latina single mothers, who are more than twice as likely to live in poverty than White single mothers. This comes as King County home values have nearly doubled since 2009. Rents are up more than 70 percent. Child care, car tabs, gasoline, food prices: everything is more expensive. While married couples, childless adults and even single fathers have seen windfalls from a hot economy, the paychecks for single mothers are frozen in time, like Alice’s son. As a result, for Phipps and others, asking if single mothers can survive in Seattle or broader King County is not hyperbole. Said Phipps: “It’s not sustainable." She has managed to stay in Seattle by sleeping in the same bed as her daughter in a small University District apartment. Pico has considered leaving the city. But, though Bothell or Renton were once cheaper options, what she could save by moving no longer pencils out after accounting for the commute. For Phipps, Pico and other single mothers, hearing that their stagnant pay was the norm more than the exception was surprising. They assumed it was just them. Breaking out incomes by family type is new to Public Health — Seattle & King County. But Director Patty Hayes sees the information as a useful tool in building a healthier community. “It's our role to help shine the light on stuff so that we can have the conversations on … what I call those ‘You're kidding me moments,’” Hayes said. For Hayes, the revelation of single mothers’ income was one of those moments. The statistics were pulled from the U.S. Census Bureau and organized through a public-private partnership with local governments, the United Way and the Seattle Foundation. The resulting information, presented on a slick website, is called Communities Count. Families led by single mothers have always been the poorest. But the gap between them and other family structures is growing in King County. The microscopic climb in income for single mothers — from around $34,000 in 2009 to $37,000 in 2016 — falls within the margin of error. During the same time period, the gap between single mothers and couples with children grew from about $70,000 to $100,000. And between 2015 and 2016, pay to single mothers actually went down by about $3,000, erasing any gains made the year before. The margin of error is wide — plus or minus $7,000 – so the apparent decline could be illusionary. But the trend for all others — including single dads — does not dip. 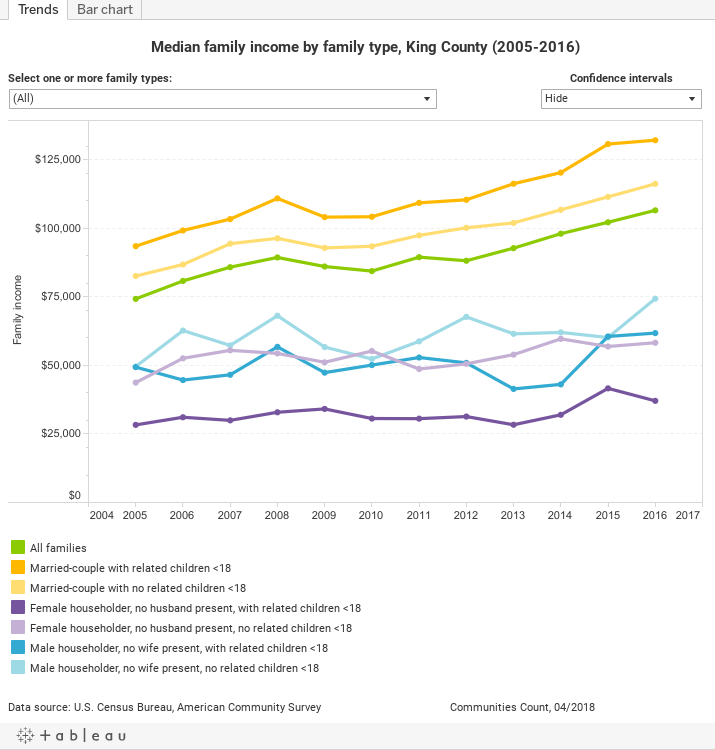 Where the median income of married couples in King County outpaces the national number, for single mothers, it is right in line. Black and Latina women fare the worst. Public Health’s Communities Count database does not break out single mothers' earnings by race. But data from the Census Bureau’s American Community Survey show a slow decline in King County of White single mothers in poverty, from 24 percent in 2012 to 20 percent in 2016. Latina mothers also saw a decline, although their overall numbers remain much higher: In 2012, 50 percent earned poverty wages; by 2016, that was down to 44 percent. Black mothers, meanwhile, saw an increase in that same time period, from 40 to 47 percent living in poverty. Like Phipps and Pico, Briana Bell thought her stagnant pay was unique to her. An HR professional by trade, she moved with her two children from Dallas to Seattle in 2014. Her pay spiked at the time of the move, but it didn’t last. Shortly after her transfer, Bell requested more flexibility from her work to parent her children. Her employer wouldn’t give it. So she left to find a job that could give her the latitude she needed to care for her teenager and younger daughter. She took a position at a recruiting firm with a base pay that was $7,000 less but promised a commission. But the recruitments didn’t come, and after a year she was let go. Bell now works part time as an executive assistant in Shoreline and collects unemployment. She lost her health insurance. Her rent rises every year, up $250 a month from when they moved into their Shoreline apartment three years ago. When asked why single mothers’ pay hasn’t budged, Hayes said she didn’t know. Public Health has conducted qualitative surveys of mothers, but broad conclusions are elusive. Still, there are some guesses. Chan offered a broader analysis. “I can imagine that if somebody is in a married couple's household, there are probably more risks you can take in terms of, ‘Let's see what I can do if I jumped jobs,’” she said. “Because you've got two incomes, you can take more risks and take advantage of this economic boom. The common thread between Phipps, Pico and Bell is the importance of flexibility in work and the enormous challenges that come when that’s lacking. Every inflexible hour represents a choice: Forfeit that time, along with the pay and possibilities for advancement, or pay for child care. A fluid schedule is so valuable that Bell took a pay cut to find it. “My boss at my job has probably been the only reason why I'm not homeless at this point,” said Pico, who does not work Fridays. Even when a single mother can find a job with a fluid schedule, that need for flexibility gets in the way of moving up. Hayes points to government efforts to stabilize families headed into homelessness, support programs for mothers and children’s health centers in schools. Seattle is also growing a subsidized pre-school program. But where those efforts support struggling women, they won’t reverse wage trends. For all the anxiety that comes with not having enough money, more corrosive is the guilt. In her first year-and-a-half, Eva bounced between three care centers. At one, Pico heard Eva was parked in front of a television all day. “There's so much around what you're supposed to do to be a good parent and it's conflicting — support your children, but also do all these things that you don't have time to do if you're working full-time,” Pico said.